My Way Travel is proud to offer the ultimate in private tours in Southeast Asia. This unique trip includes amazing cultural sites and places you in luxury accommodation all the way. 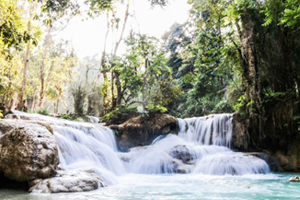 Five of the world’s most enticing countries: Vietnam; Cambodia; Thailand; Laos; and Myanmar (Burma) are waiting to show you their most exciting highlights. Your exciting adventure begins in Ho Chi Minh City (the former Saigon), Vietnam’s largest and most dynamic city. Our expert private guides and experienced drivers, will help you learn about the city’s history. You will love the magnificent French colonial landmark buildings, and mid-century architecture like the Reunification Palace and the War Remnants Museum. Cholon (Saigon’s Chinatown) has been a thriving hub of activity for as long as the city has been here, as have the busy markets and temples. Grab a refreshing Vietnamese iced coffee or snack, such as banh mi. This Vietnamese baguette sandwich is synonymous with the city. Boutiques presenting unique work of Vietnamese designers, are well worth a visitas are the renowned art galleries and museums. Tourists love a trip out to see the famous Cu Chi Tunnels, whilst observing a colorful religious ceremony at the Cao Dai Temple, is another firm favorite. 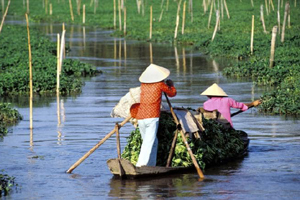 My Way Travel can also arrange additional special activities like river boat cruises, a chat with local historians, private house visits, selected musical performances,art and design tripsone or two day trips to the Mekong Delta, cooking classes, and much, much more. Up the coast to Hoi An, and a beautiful luxury beachfront resort awaits. This atmospheric port town and UNESCO World Heritage Site offers unique experiences. The Old Town here is a fascinating example of an old trading port. The early morning market in Hoi An has stalls piled high with fresh produce; fish is very important here. You enter the Old Town over the famous Japanese Covered Wooden Bridge, a landmark not just of Hoi An, but the whole country. The streets are filled with ancient old shop houses and historic temples. The tailors here are legendary, this is your chance to pick up a great hand made suit or wonderful silk clothes. 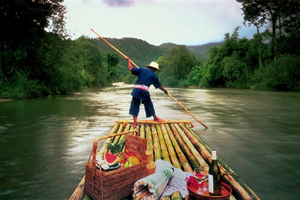 A boat trip along the Thu Bon River is a truly memorable experience also. Popular attractions include the Museum of Cham Sculpture, and the Marble Mountains, the caves of which are Buddhist temples. If you wish, we can arrange even more things to do, such as visits to local farms and villages, or maybe a cooking lesson. This is also your chance to visit the famous Cham ruins of My Son. Whilst for the more energetic among you will lovecycling through the countryside. Others may wish to learn how to make a silk lantern at a Confucian temple. For those who prefer to simply kick back and relax, the spa and beach at your resort awaits. Continuing North brings you to Hanoi, Vietnam’s fascinating cultural, intellectual and of course administrative capital.On your private tour here, you will see all the city’s most important historical attractions, these include: the Ho Chi Minh Mausoleum; the One Pillar Pagoda; the Temple of Literature; and the House on Stilts. 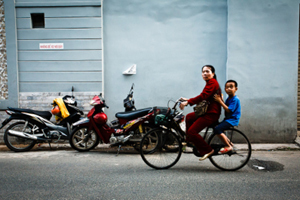 We’ll take an in-depth tour of Hanoi’s famous Old Quarter. Here the streetswere historically named after the specific trade or materials that were practiced or sold there. These include bamboo, silk and lacquer. Walking through the narrow streets, is the best way to learn about the history of the Old Quarter and to witness the traditional architecture. Nowadays of course, it has transformed into the most fashionable district in town. It is packed with cafes, boutiques, and art galleries. 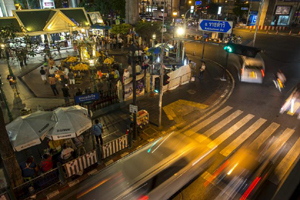 The Hoan Kiem Lake is a focal point for locals as are the streets here, lined with magnificent French colonial buildings, some of which have become fashionable restaurants. Hanoi is home to some excellent museums; the Vietnam Fine Arts Museum and the Vietnam Museum of Ethnology being fine examples. Whist in town, you get the chance to meet a top culinary expert with whom to tour one of the city’s excellent markets to sample local street food specialties. Local favourites are: pho cuon (fresh herb and beef rolls) and bun cha (barbecued pork with noodles). Be enthralled by a true Hanoian renowned water puppet performance. If culture is your thing, you may wish to attend a show at theHanoi Opera House. Fly into Cambodia and the fascinating northern provincial town of Siem Reap. 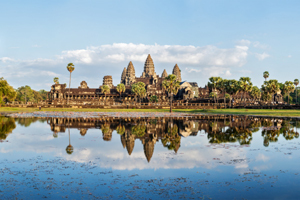 This is of course, home to the incredible Angkor temples.Your private guidewill make sure you see the most important parts of this UNESCO World Heritage Site. This wondrous ancient Khmer empireincludes, of course, the one and only Angkor Wat. The largest religious site on earth, is built sandstone and is a representation of the Hindu universe. The ancient capital city, Angkor Thom, is packed with iconic sites like: the Terrace of the Elephants; the Terrace of the Leper King and the fabulous Bayon. Ta Prohm, setting for the Lara Croft movie, is a temple that has been almost swallowed up by the jungle. The truly serene former monastery and school, Preah Khan is a wonderful setting also. Banteay Srei, is a small pink sandstonetemple famous for the elaborate carvings, whilst other lesser-known temples also await. In addition we can arrange: Khmer cooking lessons;a cruise on the Tonle Sap Lake; visits to orphanages and children’s centers; bike rides; private yoga sessions; Khmer dance performances; photography days; shopping; and village tours.If all that isn’t enough, why not charter a helicopter and fly over some of the more remote jungle temples. From here, we move on to the one and only Bangkok. There is nowhere on earth like the colorful Thai capital. Ourexperienced guide, you will help you get the most out of this fascinating city. 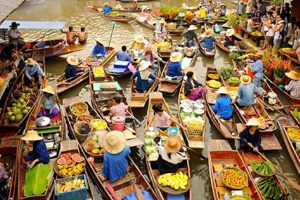 Whether its the private long-tail boat tour through the residential canals, a visit to Bangkok’s most important temples, or exploring markets overflowing with textiles, flowers, food and crafts, you will adore this incredible Asian capital. We also find time to take in small museums and interesting local neighborhoods. During your free time, slip into one of the world’s leading spas, go shopping for exquisite Thai silk, or feast on some of Southeast Asia’s absolute finest cuisine. Bangkok, is simply unforgettable. After Bangkok we move on to the more sedate Yangon in Myanmar. This was called Rangoon when the country was known as Burma, it was then the capital. 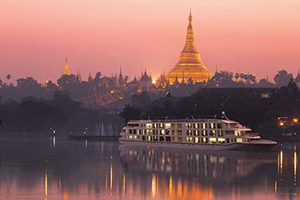 Your experienced guide will show you round the city’s highlights, including: the fabulous Shwedagon Pagoda; the reclining Buddha; and the sprawling Bogyoke Market. This was formerly known as the Scott Market, named after the Municipal Commissioner of the time, Mr. Gavin Scott. You will also have time to take in the National Museum, and the old neighborhoods that reflect Yangon’s Burmese, Indian, British, Bangladeshi and of course, indigenous influences. Continue to one of Myanmar’s most exotic cities, Bagan. Here, thousands of temples and pagodas spread from the Ayeyarwady River across miles of open plains. You will visit the structures, which were built between the 11th and 13th centuries. This was when Bagan was a major center of Buddhist for the region of Southeast Asia. You will learn about their history, by studying their layered facades. The interior frescoes and sculpted Buddhist statues, tell the stories of old. We will visit the best lacquer ware workshops in town and explore local markets and small villages. My Way Travel can, if you wish, book a memorable hot air balloon ride high above the temples at sunrise. After awe-inspiring Bagan, we move on to the Sedate northernLao town of Luang Prabang.This UNESCO World Heritage Site sits on the Mekong River. Once again, our expert guide and driver will help you experience the best of the town and its surrounding areas. The streets are lined with a unique mix of traditional Lao and French-colonial architecture. 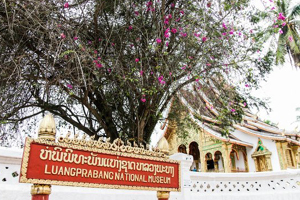 The cultural attractions include: museums and fine temples.The central role of Buddhism within Lao culture and society is in evidence everywhere. Visit markets and hill-tribe villages,meeting contemporary textile designers and expert silk weavers. If you wish you may take a delightful cruise along the Mekong River, calling at craft villages and the Pak Ou Caves, filled with Buddhist statues. This spectacular tour concludes in rural northern Thailand and the quaint walled city of Chiang Mai. Here you will be accommodated in one of Southeast Asia’s most luxurious resorts. This is set in the shadow of the foothills surrounded by lush terraced rice paddies. Here you will enjoy the craft districts that specialize in silver, teak furniture, celadon ceramics, paper umbrellas, and beautiful woven silks. We’ll pay a visit to a famous mountaintop temple. 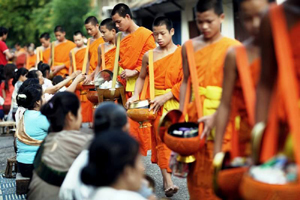 In the town you will witness monks collecting their alms in the morning. At this point we will make an excursion to visit an interesting elephant camp, whilst another day, we will take you to a morning market and to take part in a Thai cooking class. My Way Travel can arrange other exciting activities for you, including: golf; hiking; shopping excursions; delving into the Buddhist religion and even more.